Leebo the fish loves sledging, over wintery hills, dashing through the crisp snow. But when Santa needs help is Leebo up to the job ? Leebo is out late on Christmas Eve (past his bed time), and sees Santa. Santa’s sleigh skids on an ice patch and drops some presents. Santa is in a great hurry as you can imagine, and asks Leebo if he can help, otherwise some houses will go without presents this Christmas. Leebo (you) and his sledge can go very fast, using hills as ramps the sledge can get airborne. 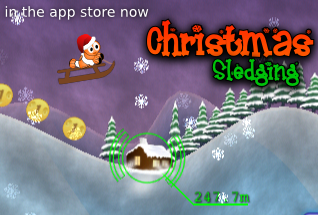 Collect the presents Santa has dropped, and deliver them to the houses whilst airborne. Simple really or is it ? Santa is on hand to train you.